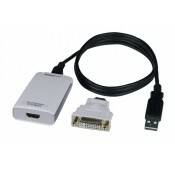 The USB 2.0 to HDMI/DVI display adapter allows you to attach one or multiple HDMI or DVI monitors or projectors to a laptop or desktop using USB 2.0 ports. There is no need to have an additional video card installed. Up to 6 display adapters can be connected to one PC. Connects an HDMI/DVI display to a USB port. Embedded audio will pass through the adapter. Built-in 2.1 channel stereo sound pass-through. Supports up to 1080p video resolution with standard and wide screen aspect ratios. One female HDMI port for connecting a display. Connect a DVI display using the included HDMI to DVI adapter.